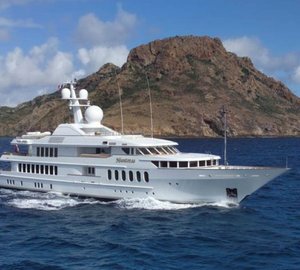 Feadship completed motor yacht HUNTRESS in 1997. Therefore, she can be categorised as having been built country of the Netherlands. HUNTRESS had her design finished by De Voogt Naval Architects and De Voogt Naval Architects. This superyacht HUNTRESS is able to accommodate a total of approximately 10 passengers all told aboard together with around 13 crewmembers. Launched to celebration by 1997 her internal styling reflects the habilitation of Terence Disdale Design. De Voogt Naval Architects was the naval architecture company involved in the professional nautical composition for HUNTRESS. Also the company De Voogt Naval Architects successfully worked on this undertaking. Interior designer Terence Disdale Design was charged with the internal interior styling. In 1997 she was formally launched to celebration in Aalsmeer and following sea trials and finishing touches was thereafter delivered to the owner who commissioned her. The Feadship De Vries Shipyard completed their new build motor yacht in the Netherlands. A spacious proportion is manifested with a total beam (width) of 9.6 m or 31.5 feet. With a 3.2m (10.5ft) draught (maximum depth) she is deep. The material steel was used in the building of the hull of the motor yacht. Her superstructure above deck is created with the use of aluminium. In 2008 extra refit work and modernisation was in addition performed. The 3512 DITA engine powering the yacht is made by CATERPILLAR. For propulsion HUNTRESS has twin screw propellers. The engine of the ship creates 1280 horse power (or 942 kilowatts). She is fitted with 2 engines. The total thrust for the yacht is thus 2560 HP or 1884 KW. As for stabalisers she was built with Vosper. Offering quarters for a limit of 10 visiting passengers sleeping aboard, the HUNTRESS accommodates them comfortably. The boat uses circa 13 proficient crew members to run. The main engines are two 1280 Horse Power / 942 Kilowatts Caterpillar. The Model type is 3512 DITA diesel. 7000 at a speed of 11 knots. 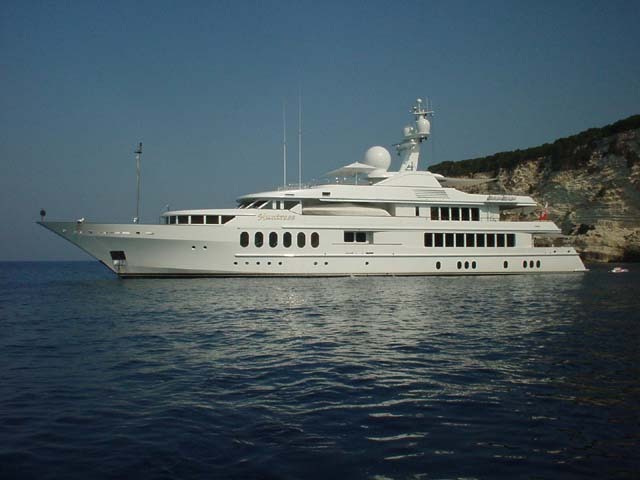 Heinen & Hopman is the company that installed the air conditioning system on the yacht. She has a teak deck.